The most complete guide for anyone looking to gain an understanding of Brain Computer Interface and its practical application in an IT and Non-IT environment. 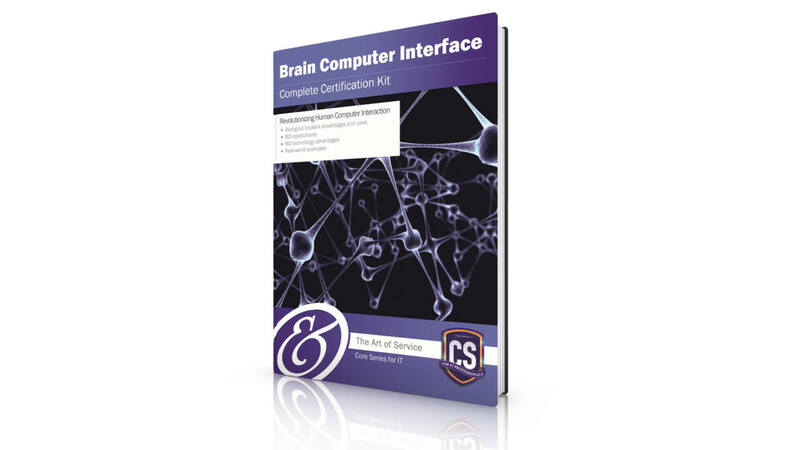 The Brain Computer Interface Certification Kit contains a study guide eBook and online course, and is delivered to you via our eLearning portal, giving you the freedom to access it anytime, whether at home or in the office. The Brain Computer Interface Complete Certification Kit is a part of the Core Series for IT, a series of courses available to help career-driven IT professionals stay relevant in their roles in the I.T. industry. Each course in the core series includes a certification upon successful completion. Explore and investigate the intricate communication methods between the brain and external devices. Start to make sense of new and improved communication tools created due to fast-emerging technology research. Ensure you get a head start and a deeper understanding of BCI applications and the benefits they have for modern day medicine. Brain–Computer Interface (BCI), sometimes called a direct neural interface or a brain–machine interface (BMI), is a direct communication pathway between the brain and an external device. BCIs are often directed at assisting, augmenting, or repairing human cognitive or sensory-motor functions. This certification would be beneficial to IT Professionals looking to gain a deeper understanding of BCIs, businesses looking to identify opportunities within the BCI field, and individuals wanting to learn about BCI technologies and uses. This certification validates that you know specific methods, models, and/or tools. This is essential to professionals in order to be updated on the latest technology trends, and to add to their BCI resource collections. The industry is facing a bold, new world with the amazing developments of Brain Computer Interface, and the challenges and the opportunities this presents are unprecedented. The Brain Computer Interface Complete Certification Kit serves as a complete introductory guide for anyone looking to grasp a better understanding of Brain Computer Interface concepts and its practical application in any environment. The Art of Service's introductory Brain Computer Interface training and certification helps IT practitioners develop the skills that are crucial as businesses embark on this massive transformation. It provides an industry credential for any IT professional to help them transform into the world of Brain Computer Interface research. This training and certification enables you to move both the industry and business forward and to quickly take advantage of the benefits that Brain Computer Interface applications present. The Art of Service IT Service Management programs are the #1 certification programs in the information management industry. Being proven means investing in yourself and formally validating your knowledge, skills, and expertise by the industry's most comprehensive learning and certification program. The Brain Computer Interface Complete Certification Kit course prepares you for Brain Computer Interface. Learning about Brain Computer Interface technologies has never been more affordable. Acquire valuable skills and get updated about industry's latest trends right here. Today. Learn from the Experts. 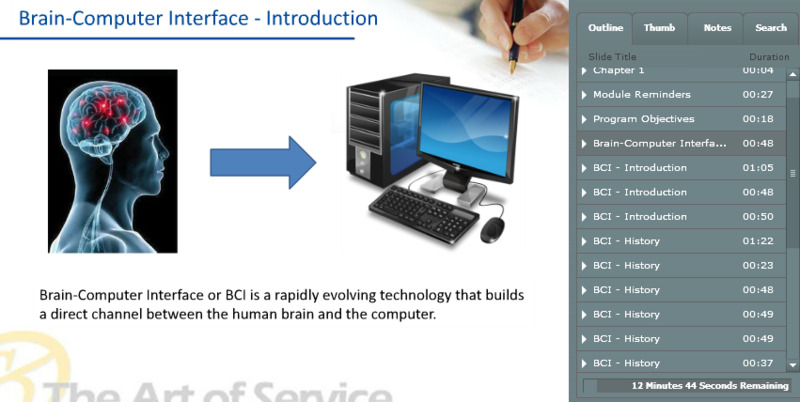 The Art of Service offers education about Brain Computer Interface and 300 other technologies by the industry's best. Learn at your own pace. Find everything right here, when you need it and from wherever you are. Learn the important concepts, advantages, and uses of BCI applications. How to use emerging communication tools created by BCI technology. 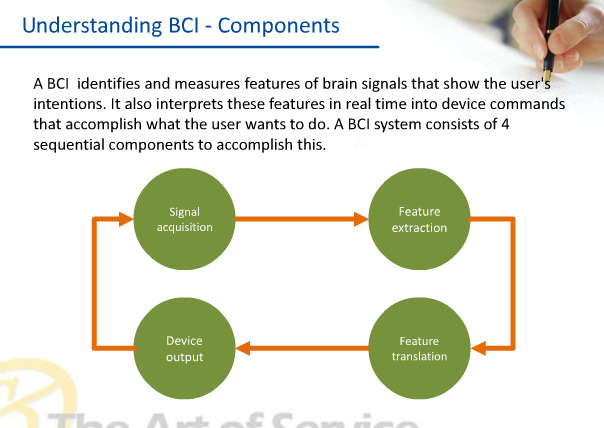 How to define requirements for using BCI applications. How to implement BCI correctly. How to recognize the advantages and benefits of BCI technology, and how it has effected wider society. Very high level, general purpose course. Not so deep as I expected, but good enough for the beginning. Good start point for the further development.